My latest creation has been much admired so with my children as photographer and stylist ("Don't smile with your mouth open mum!") 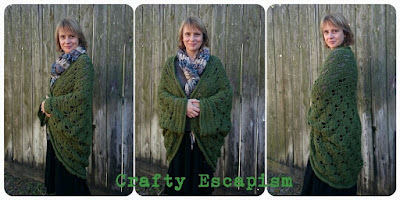 here are a few photos of my holiday project: the Butterfly Garden Cocoon Shrug. 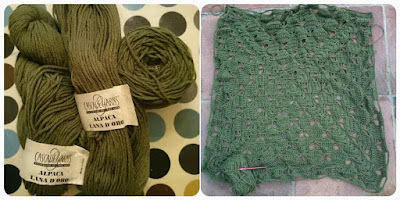 My inspiration for the construction is the granny cocoon shrug by Maria Valles which went viral on Pinterest in 2015. I've had it pinned on my "Crochet Tops" Pinterest board for a while. My last granny square shrug worked out wonderfully, see it on this post if you scroll down a little way. My butterfly garden project kept me busy over the holidays, travelling to France to see our family for 10 days. I had a large quantity of alpaca yarn (Cascade Alpaca Lana D'Oro) purchased in the final sale at the store where I work. I needed a delicate pattern to balance the dark green so found a wonderful butterfly garden square in one of my favorite books: The Granny Square Book by legendary crochet great Margaret Hubert. The construction is blissfully simple. It's just a square joined under the arms with a little bit of edging. After following the 10 rounds of the butterfly garden pattern I just kept going until I could drape my square across my shoulders down to my wrists. I seamed under the arms with a single crochet and added treble rounds to armholes and neckline. It's easy to pull on and snuggle into - perfect for January in Texas. Maria Valles provides step by step instructions for the granny cocoon shrug on her blog. There is also a video tutorial by Nadia Fuad of Yarnutopia. Some people learn best by watching rather than reading. What's stopping you?